As I was still with my colleagues who decided to extend their stay in Paris, I had to conform my ways of how I decide where I should eat in Paris. Normally when I travel alone, I will sit down on the first restaurant that I will see which has an English version of their menu (just so I’d know what will go in my mouth) as soon as I feel hungry. I normally steer away to fast foods as I’d like to be as local as possible. Anyway for the night that I was with my colleagues, they wanted to go back to Champs Elysees for reasons I don’t really understand. Well, the majority won so off we went to the fashionable avenue. There was a football match that night and all of the bars were full of people watching the game. So we strolled and strolled and strolled along the avenue still trying to agree on where to eat. The problem was, Champs Elysees offers a lot of options for diners and it’s harder to decide if you’ve got lots of options. However, our tired legs ruled over our hungry stomach and by some sort of a heavenly intervention we were standing in front of a restaurant when our legs threatened us that they will stop working if we don’t sit right away. 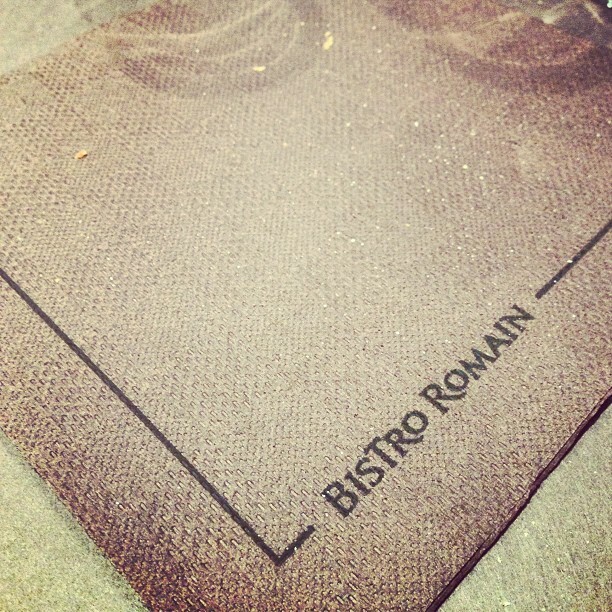 We entered Bistro Romain and the swoosh of warm air as soon as we entered was comforting and much needed (it was drizzling outside which adds up to the already cool and breezy night of Paris). As the name suggests, it was an Italian restaurant. Again, we’re eating in an Italian restaurant in Paris. LOL. It was a small and quaint restaurant with few diners that night. I suppose they were one of the unlucky ones who couldn’t get a seat in a bar to watch the game. The staff sat us in the far end corner of the place which suits us best as it gave us some sort of privacy. I was famished when I arrived so when I looked at their very broad menu, I wanted to have it all. It had an English translation by the way. The pricing was reasonable though, the steak and fries cost about EUR18 which is much more cheaper comparing it to the prices of steak in Dubai. If only it wasn’t so salty…. There you go, tantalizing me with these delicious photos again. Very good. You said you avoid fast food places. That reminds me … I read in my friend Myla’s blog that you have Korean fast food places in Dubai. That’s wonderfully strange. I can’t imagine Korean fast food. Have you ever had it? I get what you’re saying. I don’t blame you. If you go to another country and eat fast food, you miss out on a big part of the culture.